The era of Amonkhet is upon us; and, while the God Pharaoh Nicol Bolas probably will not grace Pauper with his presence, the cards almost certainly will. The new set marks the end of the Modern Masters 2017 season; a whirlwind four and a half weeks. The set had a high density of new commons make an impact, and that number goes even higher if you count two Conspiracy: Take the Crown commons released in Treasure Chests — Palace Sentinels and Thorn of the Black Rose. We will be getting to these cards later but first let’s talk about the Rogue Elephant in the room. All stats are taken from April 23rd, 2017 — one day before the season officially closed. What happens when you take one of the better decks in the format and give it a “free” 2-drop? You get Stompy. The deck basically doubled its popularity in the 5-0 win share, up from 10.69% in Aether Revolt season largely on the back of Burning-Tree Emissary. Before Modern Masters 2017 Stompy could commit 6 power to the board by the end of turn two with some combination of Nettle Sentinel and Skarrgan Pit-Skulk but that could deplete a hand while also leaving the deck vulnerable to Chainer's Edict style removal. The Emissary makes it easier to commit 6 power but also allows for more if one Emissary is used to cast another. 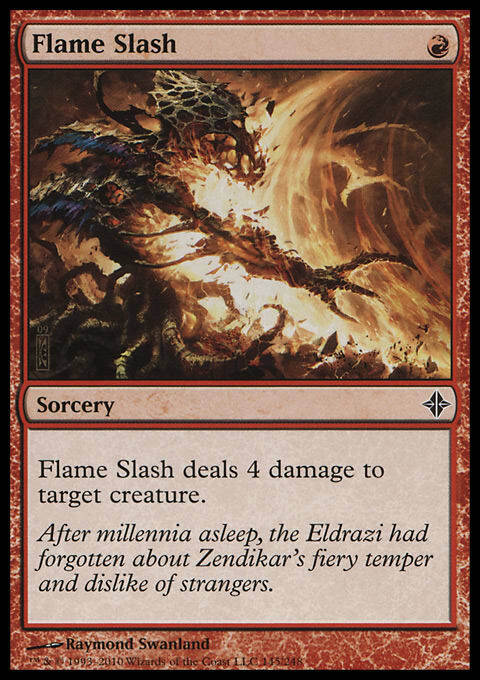 Similarly it helps to negate the efficacy of Chainer's Edict since a common follow up to Emissary is Nest Invader and its 0/1 Eldrazi Spawn friend. It is a small change, but by giving Stompy access to more lines that lead to an explosive start Burning-Tree Emissary has pushed the deck to the top of the metagame. There are some people have not picked up Burning-Tree Emissary. These players are instead relying on more traditional builds of the Green aggro deck. While this does take away some of the potential for nut-draws it does allow the deck some increased flexibility on turn two where committing two threats that cost a single Green mana is more important than trying to go Emissary into Invader. These versions are not as popular as their updated cousins but still see play. A consequence of the ascension of Stompy is the decline of some of its natural prey. Delver, the Blue deck that has been at or near the top of Pauper for years, has been usurped. And oh how the mighty have fallen. Delver has gone from over 15% of the undefeated metagame to under 4%. That decline is made more surprising by the fact that the deck has consistently played the role of monster-in-the-closet in Pauper. Stompy has a naturally good matchup against Delver and the rise of Forests has signaled a decline in Islands. Some of those Islands have been replaced with Mountains. Izzet Delver takes some of the offensive package of its monochromatic ancestor and replaces Spire Golem with Augur of Bolas, another Modern Masters 2017 standout. The deck still follows the same general game plan of establishing an early threat and then trying to keep the pressure on. 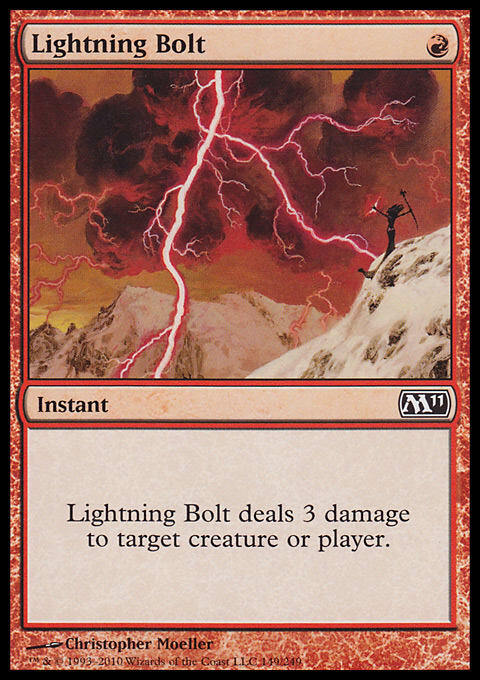 Adding Red gives the deck access to both Skred and Lightning Bolt which help to keep threats off the board. The fact that Lightning Bolt can help to end games doesn’t hurt either. Izzet Delver also runs Ash Barrens in concert with Brainstorm which is a huge draw to fans of Brainstorm plus Scalding Tarn in Legacy. The issue with Izzet Delver is its mana. While this is mitigated somewhat by the number of shuffle effects and Blue cantrips it still takes a toll. Time and mana are often necessary to acquire the correct mana mix and while Izzet Delver can catch up sometimes it can fall too far behind to recover. I am grouping these two decks together because they both operate in a similar manner. These are both Ghostly Flicker lock decks and despite the difference in mana base they both want to delay the game long enough until they can assemble Ghostly Flicker with their recursion piece and disruptive creature. Dimir Flicker does this by running removal and Counterspell to contain threats and cards like Preordain, Sea Gate Oracle, and Mulldrifter to find the correct pieces. Eventually it will establish Archaeomancer and Ghostly Flicker to either find the final piece or to start winning the game with Chittering Rats. With enough loops this can completely lock an opponent out of new cards. Dinrova Tron is based around Dinrova Horror. Where Chittering Rats can lock you out of ever drawing a new card Dinrova Horror will simply annihilate a board. Bouncing a permanent every turn while also forcing a discard is reminiscent of Temporal Fissure combo decks. In order to facilitate the 6-drop these decks have taken to running an UrzaTron mana base while leaning on Green of Moment's Peace to survive, Fierce Empath to find Dinrova Horror, Pulse of Murasa to retrieve dead pieces. While no single archetype has cracked the top 10 there are various decks that have taken to run Thorn of the Black Rose as a persistent form of card advantage. Much like the Mono-Black Control list I discussed previously these decks are designed to control the battlefield with removal spells. Eventually the benefit of drawing an extra card every turn becomes too much and these decks take over. Some players, struggling to find copies of Thorn, have turned to Palace Sentinels in their place. Modern Masters 2017 has pushed Pauper into the Red. The format, while always aggressive, now has decks with reach racing to deal 20 as fast as possible at the top of the standings. These decks often lingered behind Delver but Burning-Tree Emissary changed that. Even Izzet Delver is on the aggro side of the aggro-control divide. While damage races have always mattered they have taken on a new importance given the current lay of the land. Burning-Tree has given more decks access to fast draws which means racing is a more regular occurrence. It is a risky proposition indeed. The Monarch decks provide some reprieve. Removal has become increasingly important and establishing parity in a game is easily done given an abundance of kill spells. Once this happens a Thorn of the Black Rose can hit the table and now the defensive player is drawing two cards a turn. The additional cards makes it possible for the Monarch to start deploying threats and answers in the same turn, all while drawing more and more cards. It is into this fray where we started to iterate on Mono-Black Control. Despite early success I found this deck started to sputter after a few runs. Simply put the early removal was lacking. Black has excellent removal once the second turn hits but the color’s 1 mana options are lacking. Dead Weight and Disfigure have their uses but falter in the late game. Ghastly Demise is useless on the first turn while Vendetta is a high risk play given the amount of damage that can pile up. Innocent Blood would be much better if not for Young Wolf. Tragic Slip proved to be the best especially when paired with Chainer's Edict but having too many copies was problematic. If I was going to make a Thorn of the Black Rose — Evincar's Justice deck work I would have to dip into Red. 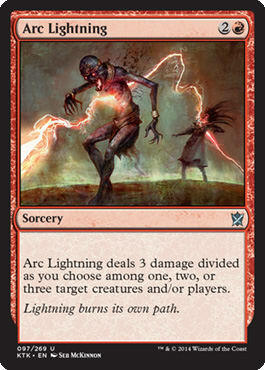 Red provides access to Lightning Bolt and Flame Slash — two of the better single mana removal spells. While these are fantastic I was also drawn to Pillar of Flame and Magma Spray as they could pick off Young Wolf and Stormbound Geist. Pairing Red and Black also gives you access to Terminate which is a fantastic option if you can meet its rather prohibitive casting cost. When looking at the Rakdos decks that had gone 5-0 I noticed how much they damaged themselves. Between Night's Whisper, Read the Bones, and Evincar's Justice, these decks were taking away a third of their life total in an effort to gain card advantage. Some had taken to running Radiant Fountain in addition to Bloodfell Caves. I did not like this approach as it is an attempt to cover up one crack in the wall by taking plaster from another. A Radiant Fountain might make a Night's Whisper easy on the life total but it has the potential to strand key spells in your hand. If I was going to run a land that gained two life, I might as well have it tap for a color. I quickly discarded Green as a lifegain option. Pulse of Murasa is at its best with value creatures and this deck was not running the correct ones (read that as Mulldrifter) to have the spell make the cut. Instead I turned to White and Arashin Cleric. 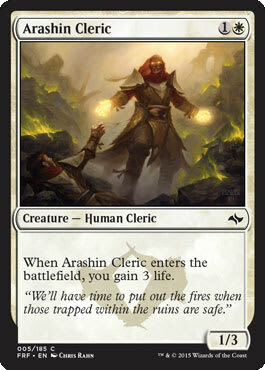 Yes, Arashin Cleric over Lone Missionary. Because it survives Evincar's Justice. The deck performed admirably and definitely proved itself worthy of additional consideration. I went into the brain trust, working with Jason (of Murasa Tron), Jon (of Tortured Existence), and the duo from Color Commontary Mike and Adrian on tuning the list. 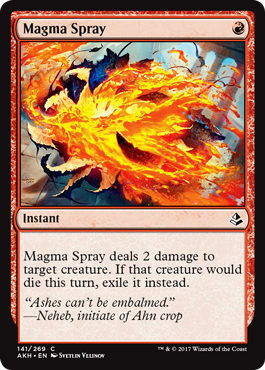 Jason immediately suggested Magma Spray over Pillar of Flame and given the deck’s need for instant removal it made sense. The group suggested adding a land and I was hesitant. Instead I added a single Renegade Map which I loved. The Map made it easier to keep land light draw and gave me the chance to draw into more business in the early turns without needed to spend a mana on Ash Barrens. In games where had enough mana I would set a stop on my Upkeep to thin my deck with Map and increase my chances of drawing into business. Three Lightning Bolt is a concession to the number of larger creatures in the format while the three Flame Slash are included for their ability to kill those creatures that Lightning Bolt struggles against. Tragic Slip can take down even the biggest creature provided another thing has died that turn — something that Chainer's Edict makes happen. Arc Lightning picks off three small threats or a 2 toughness creature and pings something else. Firebolt does its stuff twice while Terminate Kills something that absolutely must be gone. Magma Spray is there to help deal with the copies of Young Wolf running around. 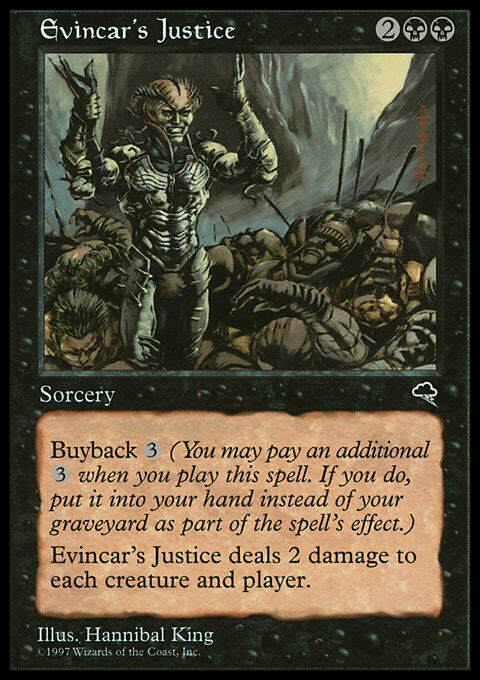 Finally there’s Evincar's Justice, one of the best board wipes in the format. Given how many decks are loaded up with two-toughness creatures at the moment this card is often a three-for-one or better. The instant speed removal is important and there would be more if it matched up better against the format. Being the Monarch means drawing a ton of extra cards and being able to use them during your opponent’s turn maximizes the Monarch draw, which takes place during your end step. Arashin Cleric absorbs a hit while providing a boost to your life total. Phyrexian Rager is just solid as it will always replace itself. Beetleback Chief makes a small army which can help you turn the corner late while Gurmag Angler is there to close out games. Warren Pilferers live through Justice while also getting back your best creature (sometimes giving you haste) and work well in the late game with Kor Skyfisher. Speaking of Skyfisher, this workhorse helps to reuse all the fun enter-the-battlefield triggers featured in the deck. Thorn of the Black Rose is a stellar blocker and helps us get ahead on cards thanks to making us the Monarch. 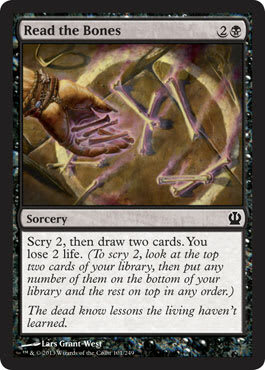 In addition to Phyrexian Rager, Warren Pilferers, and Thorn, the deck features three copies of Read the Bones and a Font of Return. The Font helps the deck reload in the late game and helps to ensure that there is enough power present to win the game. Read the Bones is an incredibly powerful card that can get you four cards deep and helps to keep gas flowing in the middle and late stages of a game. The mana base, including the signets, is designed to try and have access to removal turn one and two. Beyond that it is about keeping your life total high enough to start taking over the game with removal and blockers. Mardu is a midrange deck but it is most certainly not a control deck. It needs to stay alive long enough for its high quality cards to come online. Blocking is more important later in the game when the Monarch is active but sometimes you will have to block early. Managing your life total is one of the most important aspects of playing the deck. Often you have to walk a razor’s edge and go down to a low life total in order to start clawing back in. Sometimes you will kill everything and run away with the game. Other times you will be biting your nails hoping they do not have the last piece of reach needed to put you away. Given that I still think this deck is great for the next few weeks. Amonkhet does not look poised to shake things up too much and if you can get your hands on Thorn of the Black Rose, Mardu is a great way to use the Monarch to your advantage. The core of the deck is about using the Thorn with Justice — everything else is about staying alive. Nothing in the deck is written in stone but given the abundance of great removal in Pauper it should be easy to adapt the deck for the evolving metagame. And hey — sometimes it is just fun to take out every creature on the other side of the table.